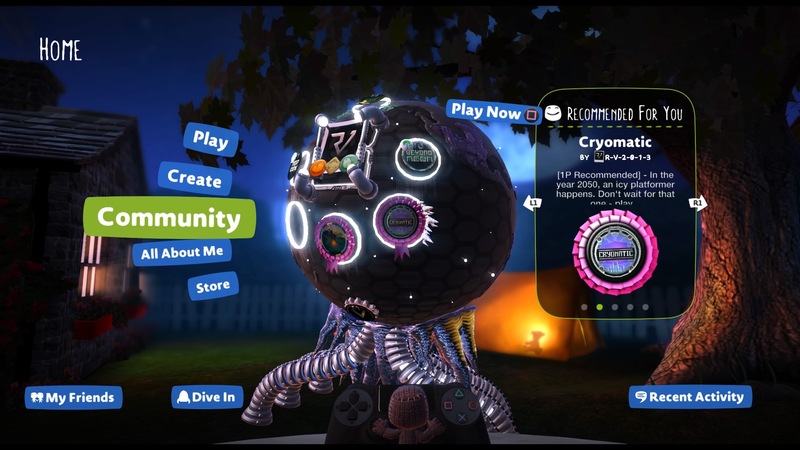 LittleBigPlanet 3 is receiving a grand makeover today with our brand-new Community UI that will make it easier than ever before to find exactly the type of content that you’re looking for and help you meet up with old and new friends alike for in-game activities! Gone is the multi-planet structure that we had before and now everything is focused down to just a single planet view that magically morphs into each destination as you scroll through your Pod Computer menu. Have no fear though! Nothing has disappeared and you can still find all of the previous functionality within each planet with just a quick tap of the X button. So let’s take a look at the major changes of the new Community UI! Play remains relatively unchanged and gives you access to the main Adventure and Popit Puzzles. 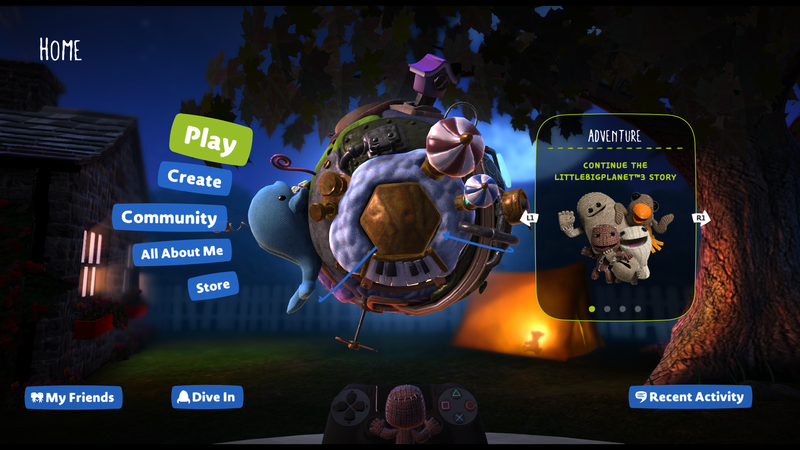 You can also find any More Stories level kits that you have purchased here too and there’s also a brand-new feature tucked away here that will be coming to LittleBigPlanet 3 soon! Are you feeling that creative buzz today? You can create away to your heart’s content under the new Create category that contains your Moon with all of your saved creations on it. You will also be able to decorate your Earth and Moon here for other players to see. The full range of Tutorials are available here, should you wish to pick up a few pointers for your latest creations! 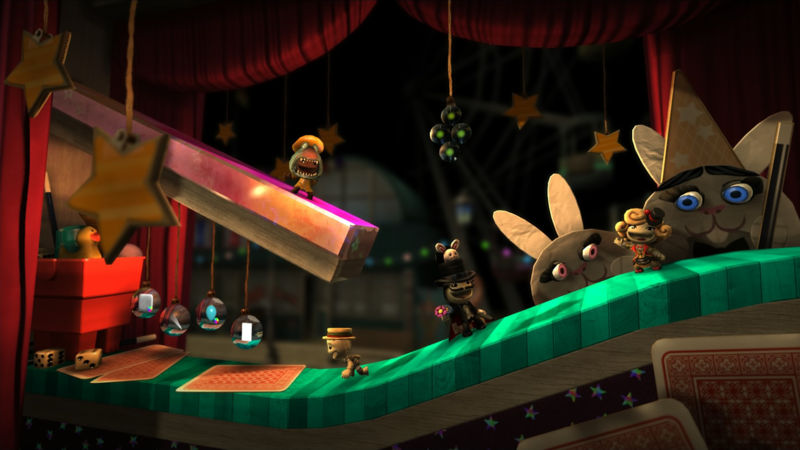 It has never been easier to find great levels to play in LittleBigPlanet and we have pulled a handful of great levels to the very top for instant viewing! With a simple tap of the L1/R1 Buttons, you can view the Level of the Day, top Recommended For You, Team Pick and Busiest levels; along with the most recently published creation. Want to search a bit more in-depth? Just tap X on Community and you will be taken to the regular Community Menu that you’re already familiar with. All About Me is your little personalised corner of the Omniverse where you can customise your profile’s avatar and description.You can also read your profile comments and check out your ever-growing Pin collection with helpful hints on Pins that you are close to earning. 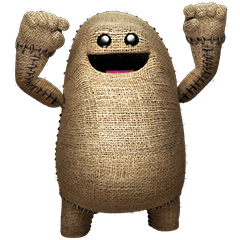 The Store contains all of the available Level Kits, Costumes and add-ons that have been released for LittleBigPlanet that can be purchased to continue your Sackboy or Sackgirl’s adventures or fill out their Popits with costumes and assets to create with. 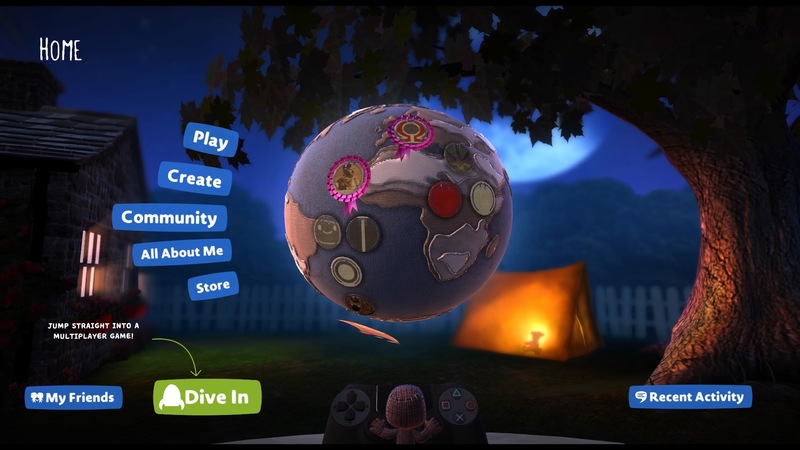 My Friends and Dive In – new ways to join other players! 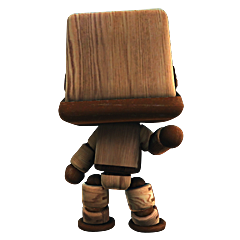 Want to join some other Sackfolk for some fun in LittleBigPlanet? 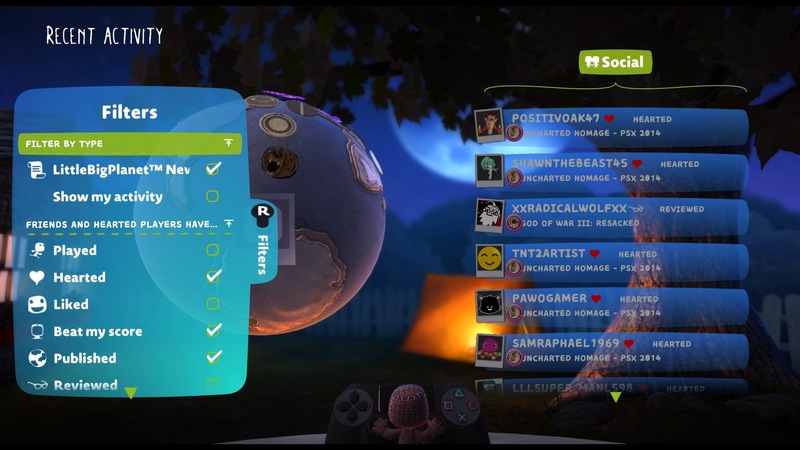 All of your Online Friends can be discovered at the bottom of the screen and by tapping L1 and R1, you can flip through all of them and then choose to Join them or Invite them to your Pod. 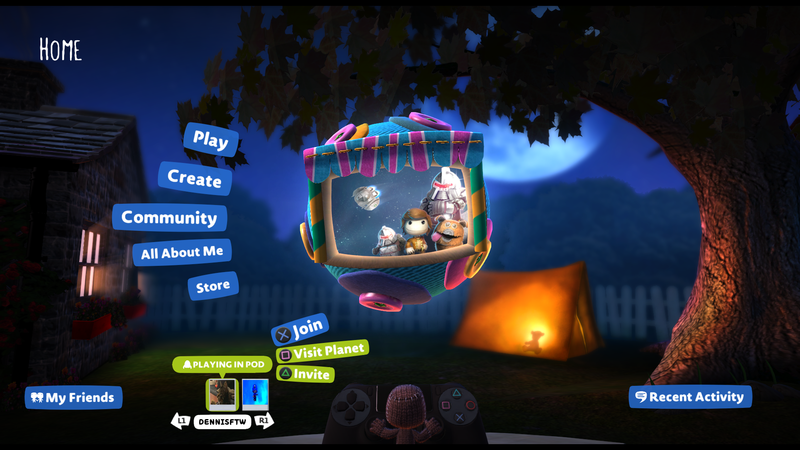 You can even visit their Planet to view their creations and online profile. If you don’t have any Friends online, then you can find the Dive In button in place of them which can be selected to allow you to meet some new players and possible make some brand-new friends! Clicking on My Friends will also allow you to all of your Friends and Hearted Players, even if they’re offline and you can additionally find the Dive In button here too, should you want to use it at any time that you already have friends online. Recent Activity – new filters for finding content! 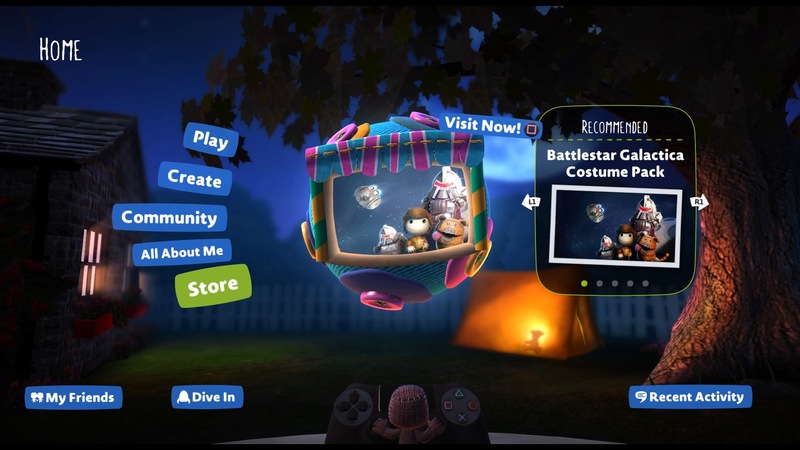 Under Recent Activity we have expanded the selection of Filters available for searching recent activities and content in LittleBigPlanet 3. With a tap of the right stick, you can pop out the new selection of Filters to allow you to customise your Recent Activity to show exactly the type of activities that you wish to see. Best of all, your selected Filters will be saved between game sessions. So if you set it up just how you like it, you can leave and return later to find your Filter settings still configured to how you last left them! Making them just perfect for giving you a very personalised overview of the recent activities! 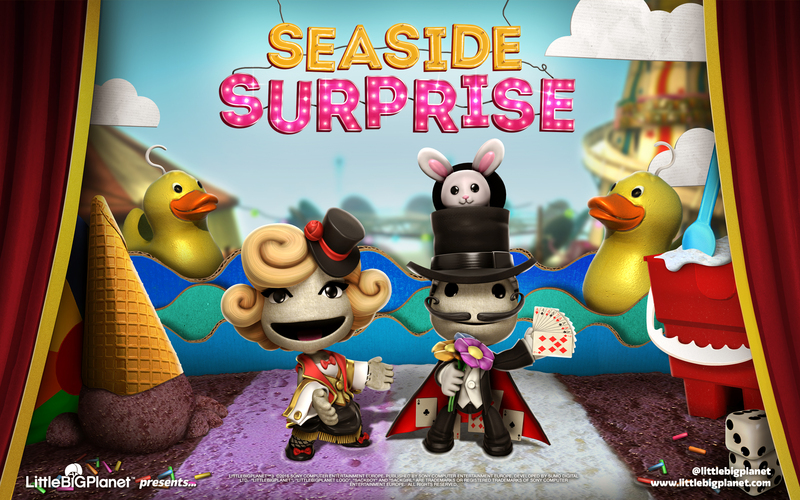 The fun doesn’t stop there though and you can take a magical trip to the seaside with the Seaside Surprise Level Kit for a grand ol’ time and make sure to comb the beach, funfair and theatre for a collection of seaside and magic-themed goodies for creating your own levels. 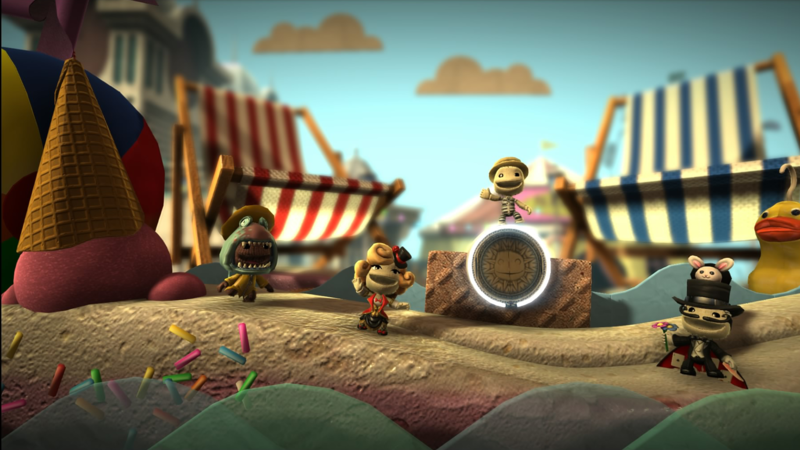 A brand new level – Seaside Surprise: Sackboy and Sackgirl can take a lovely seaside holiday in the brand-new Seaside Surprise level to enjoy the local attractions and can even pop-by the theatre for a surprising magic show! 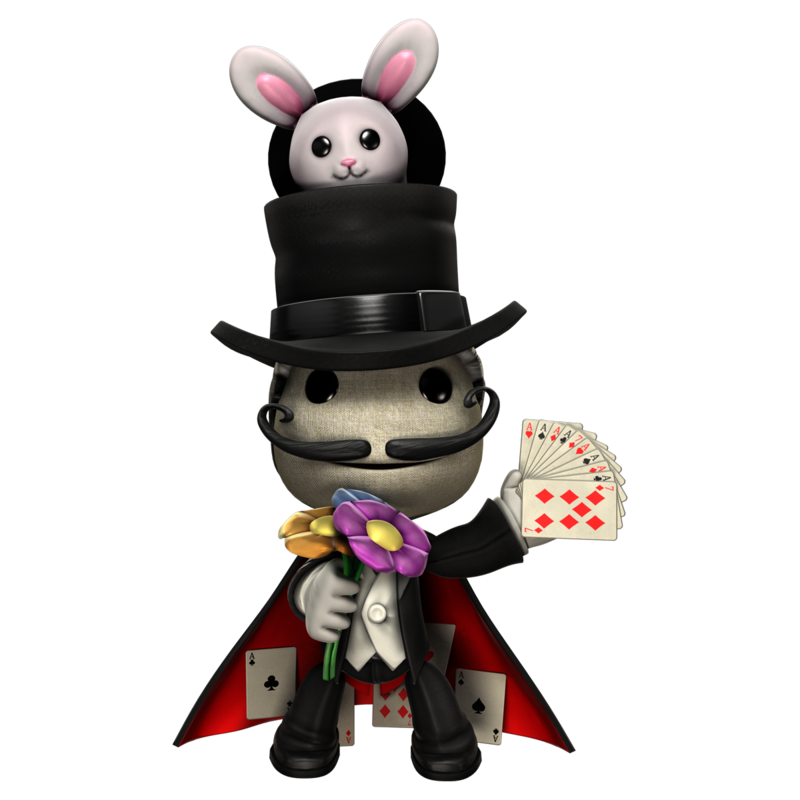 Two new Seaside Surprise costumes: Whilst you’re at the seaside, you can pick up two new costumes that will turn your Sackboy and Sackgirl into either a magnificent magician or a glamorous assistant. One interactive music track, 9 music sequencer instruments, 41 sound effects: Add a jolly seaside tune to your own creations with a new interactive music track or compose your own ditty with nine music sequencer instruments. 41 new sound effects are also available to really help visitors to your seaside attraction really feel as though they’re by the sea. A new background – Seaside Pier: A trip to the seaside just wouldn’t be complete without a visit to the pier reaching out into the sea and with the new Seaside Pie background; visitors to your level will be able to see this lovely pier wherever they go. 17 materials, three objects, 38 decorations, 97 stickers: It just wouldn’t be a trip to the seaside without picking up a selection of souvenirs that you can use in creating your own seaside and magic-themed creations. Take them home and show your friends all of your favourite things about the seaside in your latest creations! The Seaside Surprise Level Kit is available to purchase now. 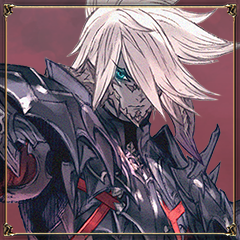 Mm Anniversary Costume Pack coming tomorrow! 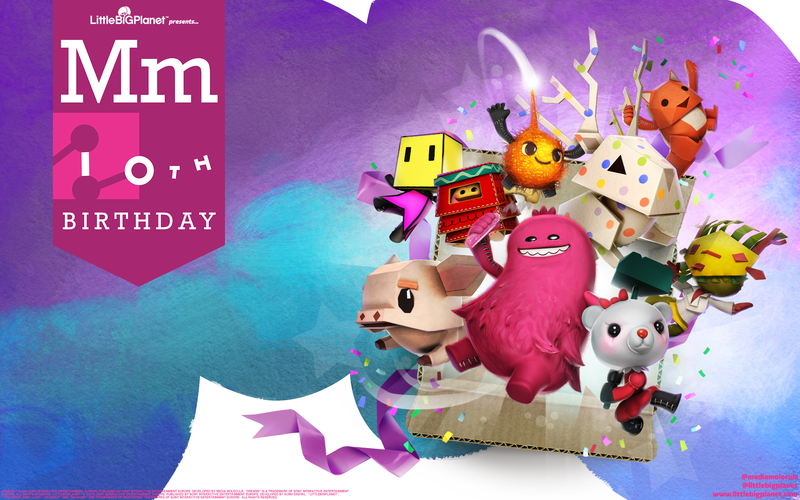 This year marks the 10th birthday of our very good friends at Media Molecule and we couldn’t let the year slip-by without celebrating this milestone birthday of the original creators of LittleBigPlanet in our own little way. 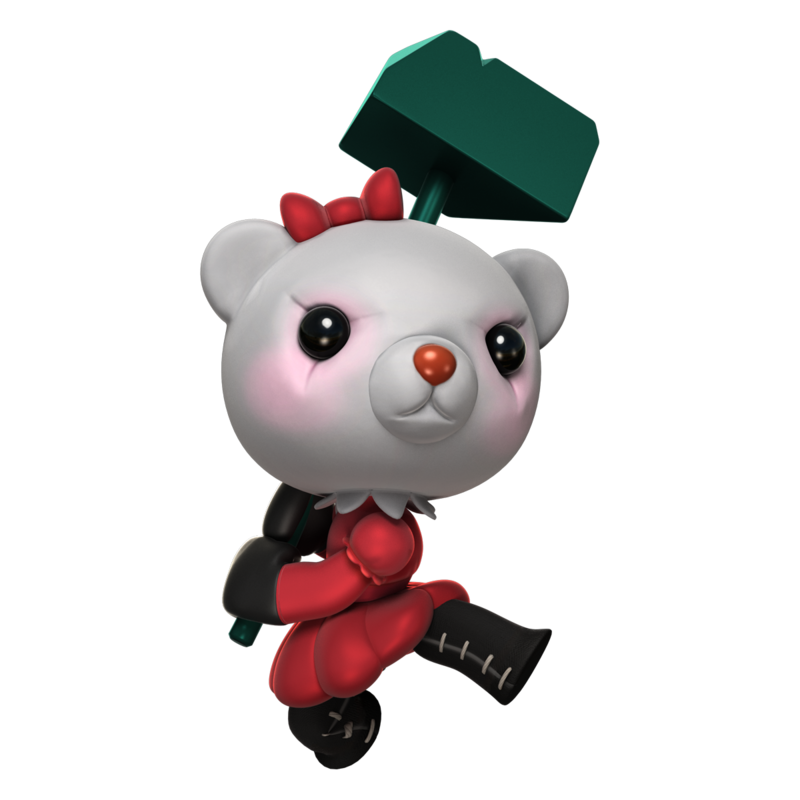 So we’ve put together an absolute bumper collection of nine costumes based on memorable characters created by Mm themselves in the Mm Anniversary Costume Pack! 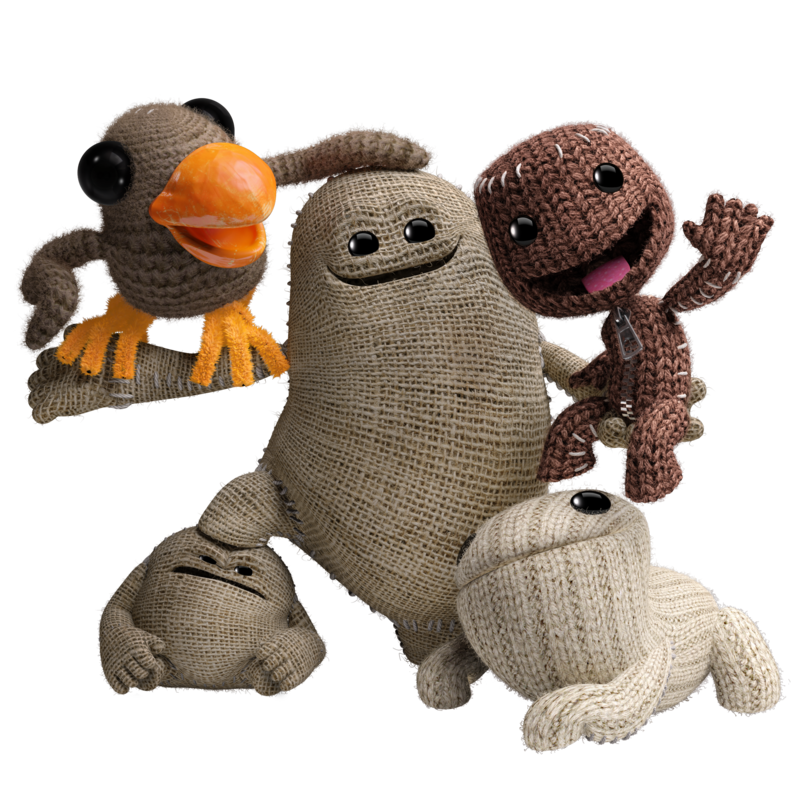 Whilst Sackboy is very dear to our hearts, we have a lot of great memories with all of these great characters! Which is your favourite? Do you remember where you first saw them? We would love to hear your stories of meeting these great characters! Each costume will be available for purchase from tomorrow! Alternatively you can purchase the complete Mm Anniversary Costume Pack containing all nine costumes at more than 60% off compared to purchasing them individually! 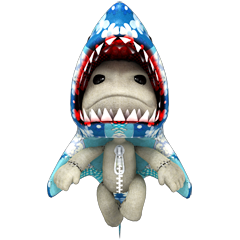 You can find out more about the contents of the Seaside Surprise Level Kit, Mm Anniversary Costume Pack and all of our add-ons for LittleBigPlanet in our Game Add-ons Catalogue. 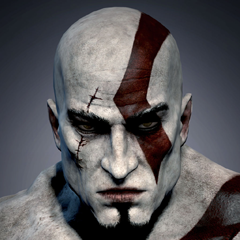 Wish Sony would advertise\promote this game a bit better. 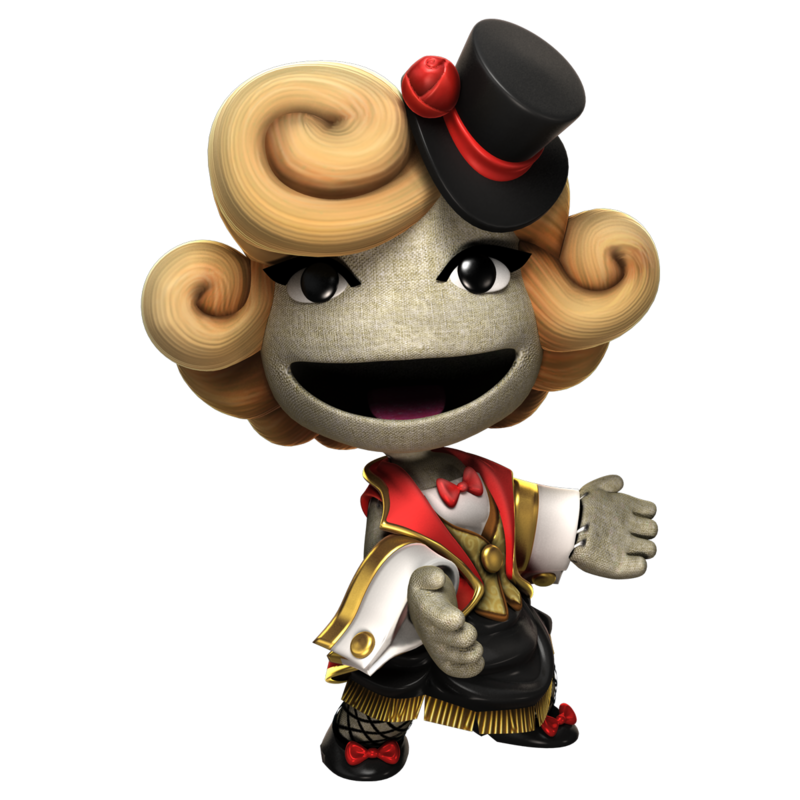 Used to hear allot about lbp on ps3 years ago, now i never even hear it mentioned, which is sad as to me lbp is one of PlayStations main mascots. Considering the game is practically dead compared recent times why would they? 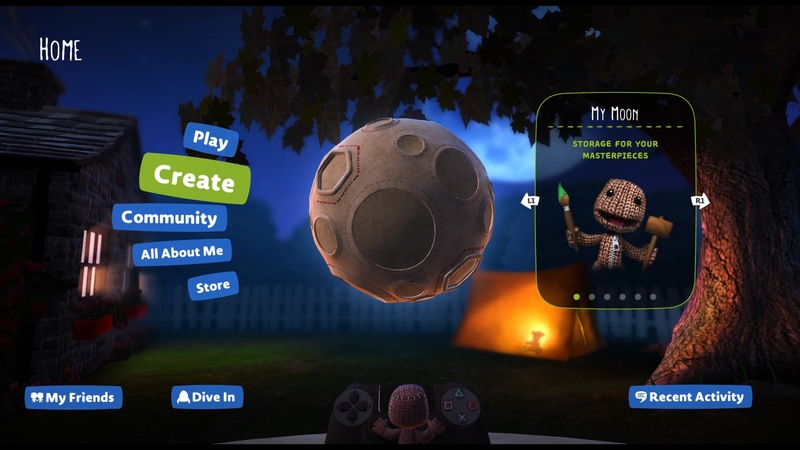 Also if Mm and Sumo Digital worked together and created LBP4 I’m sure it would have plenty of backing behind it with advertising. Why is the Yellowhead costume on the Anniversary Pack 3D? 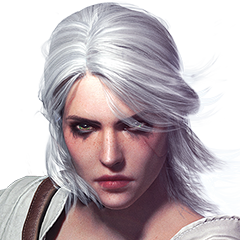 Why not just do the original outfit as seen in the previous games? 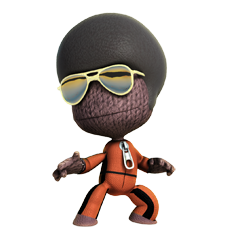 @Maxdiehard may seem to be a bit pointless releasing the same type of outfit that you could get in LBP1. 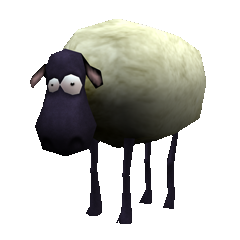 From LBP1 you can get it for free but the 3D one you have to pay for. 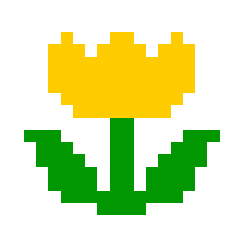 I’ve been unable to obtain the original Yellowhead, along with a lot of the original outfits. Nice crossed-out Challenge button. 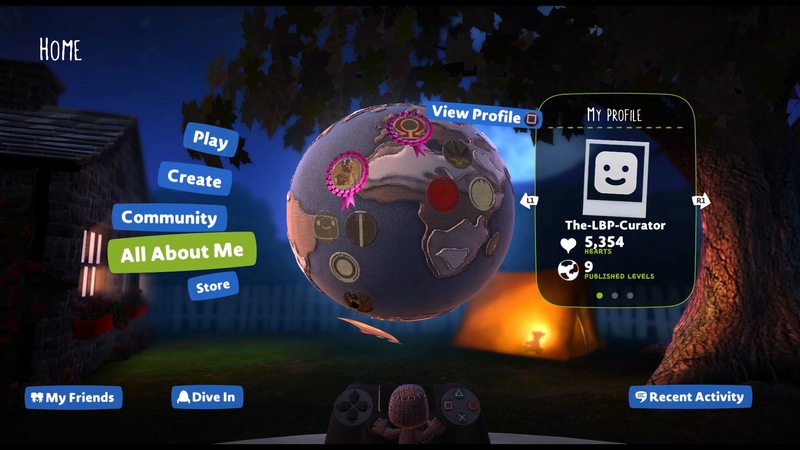 Does this mean LBP Hub is finally out of limbo or are you just adding the challenge functionality to LBP 3? That would mean you wouldn’t have to pay for the original two games, why would they do that? Hey I need help getting my rares like the birthday cake costume. AND PLEASE REMOVE THE PS PLUS ONLINE FEATURE!!!!!!! 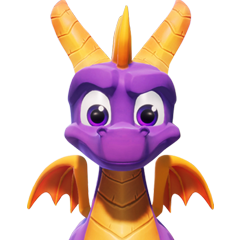 PLAYING BY YOURSELF IS NOT FAIR IF THERE ARE ITEMS YOU NEED TO GET WITH OTHER PLAYERS OR A MULTIPLAYER LEVEL!!!!!! Sorry bud’ you gonna need PS+ to play any game online and that isn’t changing. Also the birthday cake is unavailable now to my knowledge. It would be nice if we could add more people to the private chat party instead of the paltry eight that’s only allowed. Not sure if this is the right place to ask, but since I’ve installed the update I lost all the progress made on the Story levels; it’s kind of strange because I still have all my materials, objects, stickers and all that stuff (even the pins), but I can only play the first level of the prologue, as if I had erased all progress on my game. Just wanted to know if this happened to someone else too or if I just need to re-install the update (if that is even possible). Everything else works fine, kinda miss seeing all the planets together though (thanks for keeping the game awesome!). 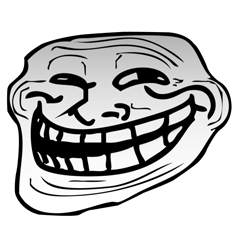 Is the patch available for PS3 too?